I was chasing a nasty squeak coming from the back of the car and discovered it went away when I tapped on the 3rd brake light. 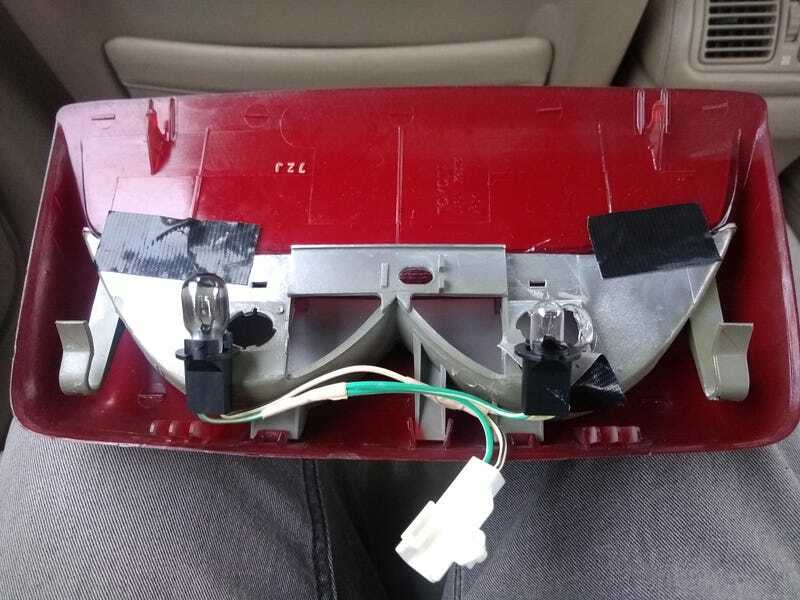 Stroke of luck, though I, I can fix this squeak and also the annoying tail lamp warning light! Took the 3rd brake light assembly out (lift and pull, folks) and found the picture above. The original bulb, a bit the worse for wear, in the left socket, and a totally inappropriate but working bulb in the right. 3 watts does not equal 18 watts. Two new bulbs later and a little duct tape to keep the plastic from squeaking (it lives right next to the oem subwoofer and takes a literal pounding) and my squeak and warning light are both gone! I also wiped down the leather surfaces with some Lexol and used some Megs Interior Detailer on the dash surfaces and wood. The white lettering on the buttons went from a light brown to a brilliant white (ewwwww) and the wood now has a deep shine back to it instead of years of I-don’t-want-to-know drops dried up on it. Still considering taking it somewhere to have it properly detailed inside due to my lack of an extractor or anywhere to plug in a vacuum.